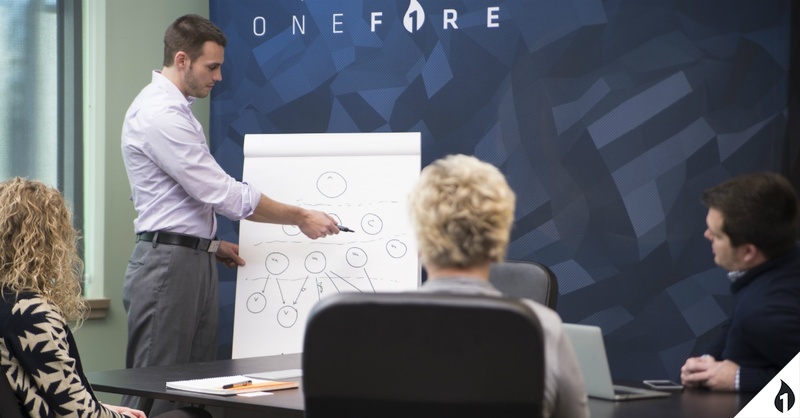 OneFire is a leading Innovation Consulting Agency that helps businesses develop and execute successful innovation strategies. What is an Innovation Consulting Agency? An Innovation Consulting Agency has proven processes in place to encourage ideas and act on innovation. They share that knowledge with other businesses, helping them develop and improve upon their own processes. Most companies are not built for innovation. An Innovation Agency like OneFire can help those companies reexamine their business models and find ways to innovate. Any business that is looking to position itself for future success should start developing an innovation strategy yesterday. Technology is moving rapidly and every business is going to be affected. Those who can't adapt to change are unlikely to stick around much longer. That's why teaming with an Innovation Agency can pay dividends. OneFire Labs is an idea accelerator - vetting great ideas and quickly making them a reality. OneFire Labs also consults for other businesses who want to refine their processes so that they can innovate successfully, too. The Nucleus Process has created apps like 'What the Fish? !,' 'LocalHunt,' 'FollowUp,' and 'CheckPoint.' Plus, there are more projects in the pipeline. The Labs team wants to help companies ideate, create, and push those creations out the door for the betterment of the world (and their business). Innovation won't wait. The time to prepare for the future is now. If you're unsure of what that looks like or you're uncertain you have the processes in place to encourage and execute on innovation: team with an Innovation Agency like OneFire. Forming that partnership will give you access to a team that is built for innovation and can show you how to modify your company so that it is built for the future.